The Flash Your Badge program entitles you and a guest to discounts throughout the city. No need to print the passport, all you have to do is present your delegate badge at participating vendors. Healthy Parks Healthy People is a worldwide movement, launched by Parks Victoria (Australia) in 2000 to encourage the connections between a healthy environment and healthy society. Backed by a growing body of evidence, Healthy Parks Healthy People has expanded and is receiving global attention. 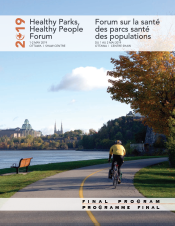 In Canada, both parks and health organizations have launched their own programs. Improving our physical health, our mental health and social connectedness through changes to where we live, work and play is a well-founded concept. Bringing ideas and insight from different sectors, the panel will explore how and why the design of, access to, and user experience in parks and greenspace matters when working towards improved population health outcomes. The Nature Playbook emphasizes connecting a new generation with nature. It is a long-term strategy for individual, societal, and environmental health that is holistic and empowering. As a practical action guide, it is meant to provide suggestions, but ultimately enable users to decide what best works for them. Our vision is for the participants in this workshop, and at this conference, to take on the role of champions for the Nature Playbook and its message. In the capable hands of those who are already engaged, we can start to reach into outer circles to widen the sphere of influence for connecting children and all young people with nature. The skills shared along with the tool in this workshop can help people in all sectors to engage themselves and others in a renewed relationship with the natural world – for our health, the health of society, and the health of the land. Better inform the creation, implementation, monitoring, and evolution of progressive policy, plans, and designs that promote well-being. Today, months after the release of the Community Well-being Framework, city builders are turning to health professionals and community groups to leverage the Framework. This session will provide an overview of the Community Well-being Framework and engage participants to critically apply it to their work. Excessive screen time is an emerging public health issue, particularly amongst children. This session will provide a summary of the impacts excessive screen time is having on children's mental and physical health, and explore ways in which spending time in nature can provide opportunities to connect with family and promote a healthy lifestyle. This session will showcase Nature Canada's NatureHood program as an opportunity to explore nearby nature and how it can be a catalyst for visiting parks. Participants will identify challenges and barriers parents may face with reducing kids’ screen time and spending time in nature, and opportunities for the health and nature communities to collaborate on how to help parents overcome these barriers to navigate a healthier relationship with screens and encourage more time in nature. Join a diverse group of nature-health advocates from across the country for a discussion about the health benefits of green time and some innovative projects in this field taking place within Canada. The panel will review the current research on the health impacts of time spent in nature, explore the use of nature by traditional healers to improve the health status of their local populations, and showcase nature engagement projects taking place on both local and provincial levels. Participants will leave with an up-to-date understanding of the body of research on health and nature, concrete ideas for programs and events that increase the nature-health connection, and new contacts with advocates from across the country that they can use to promote the health benefits of green time within their own communities. Measuring the impact of parks and natural environments on individuals’ mental and physical health is challenging using traditional instruments. In this hands-on workshop, attendees will be introduced to the Ethica platform and shown how to design, test and refine, deploy, and monitor longitudinal studies leveraging smartphones’ embedded sensors and wearable devices to capture minute-resolution sensor data on participants’ health behaviours, and episodes of exposure to natural and built environments. Attendees will obtain experience in using pedometers and motion sensors to capture physical activity levels and sedentary behaviour, GPS to capture location, and Bluetooth beacons to measure the proximity to others or resources of significance. Attendees will also use combinations of such measures to infer times that participants spend indoor and outdoors. Attendees will further use Ethica to graphically define survey instruments, including features such as audiovisual questions and skip patterns, so as to understand participants’ experiences, quality of life, knowledge, attitudes and beliefs. Facilitators will further demonstrate how to perform experience sampling by contextually triggering surveys based on sensor (e.g., GPS) readings. We will also demonstrate how open-source tools Kibana and VEGA can be used for real-time visualization of large amounts of participant data. This session will provide an interdisciplinary and collaborative environment to address decision-makers’ perspectives on unstructured play in parks. It will also provide a platform to discuss perspectives on children’s risk-taking at parks, barriers to children’s unstructured play, and how parks can better emulate an unstructured, nature-based, and free environment in urban and rural areas. Topics to be included are the need for unstructured, nature-based, and free play, how to better construct urban environments to prioritize children’s unstructured play, and how to address fears associated with children’s unstructured play. HEALTH PARKS, HEALTHY PEOPLE: WHERE DO WE GO FROM HERE? In today’s urbanized society, it is increasingly important to prioritize opportunities for contact with nature. But how do we accomplish that goal? After two days of discussion and exchange, this session will explore the future of the Healthy Parks, Healthy People movement as our keynote speaker shares her reflections on the Forum’s proceedings in the context of the broader international context. Developments from Europe and the United States will be discussed as potential drivers of ongoing work in the Canadian context.